Vacahouse Huaraz B&B is a cozy and functional accommodation lodge that will ensure our travellers and guests a great experience. We capitalize our experience in the sector and our knowledge of the city to bring the very best of our facilities and the city to our guests and travellers. 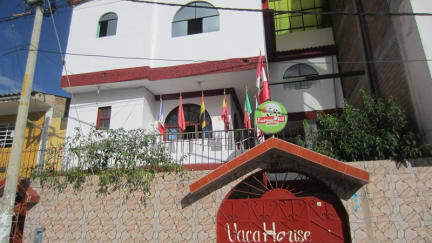 Vacahouse huaraz B & B is located next to FAP Park, one of Huaraz's most beautiful parks, and a four minute walking from Huaraz Bus Station and Main Square. To be more exact, we are near to some of the finest attractions of the city such as Museo Regional de Áncash, Catedral de Huaraz and Plaza de Armas de Huaraz, amongst other interesting spots of the city that are easily reachable from our facilities. All rooms at Vacahouse Huaraz B&B are bright and have a private bathroom. In this sense, we are focused on accommodation option for travellers and backpackers, which means that we offer several dorms with a capacity of four people each. On the other hand, we also feature a private room ideal for couples that are travelling together and are looking for some quietness and relax. Furthermore, the hostel has a kitchen in common use as well as common areas to the disposition of the guests and travellers. If you arrive early with advance notice, the luggage can be stored until your room is ready at the usual time of arrival. Afterwards, the corresponding registration form, the payment of the room and the delivery of keys will be made. Rooms must be vacated at 11:00 am to be done. After this interval of time, if you continue in your room, you will not go to do that service. Late departures or early entrances to the established schedule must be consulted in advance and with prior permission. For the safety of other hostel guests, (even for you), guests are not allowed to invite people (not hosted) to the hostel, even if they are their friends or relatives. The hostel will not be responsible in case of loss, damage or theft of the belongings of the guests, being the only ones responsible for their property.